You are an iron fist with teeth bared. embossed in sharp rows on my cheek. to ask you to quieten down. and wire. That's all that you are. But then I put my ear to your lips, and hear gunfire. Claire Askew, 25, is a poet who lives in Edinburgh, and is studying for a PhD in creative writing. Her parents gave her a typewriter when she was a child, which sparked her interest, and she began to collect them while she was at university. Now she owns 18 typewriters and uses them to write her poetry on, instead of using a computer. 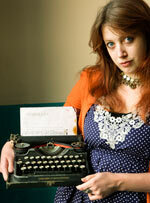 She also edits a new writing magazine, Read This, and keeps a blog at readthismagazine.co.uk/onenightstanzas. The typewriter is where it all comes together. I don't start working out where the line breaks or stanza breaks are going to go until I type. When it's in the notebook, it's a fluid thing, but once it gets on the typewriter it becomes a poem – if that doesn't sound too pretentious. I find it very, very difficult to write as well on a computer as I do on the typewriter. Perhaps it's because you have to think much more carefully when using a typewriter, because if you make a mistake you have to start all over again. If you do it on a word processor you can start and then come back to it, delete whole stanzas in a second; it's almost too easy. My first typewriter was a Smith Corona, which used to be my dad's when he was at college in the 70s. It's a very retro, grey-and-white machine. I started typing things on it because it was a bit of a novelty, but I found that I really liked it. I soon started getting interested in different makes and models. I found out that Allen Ginsberg wrote on this kind of typewriter and Ernest Hemingway wrote on that kind of typewriter – I began to learn about the mythology. I really wanted an Olivetti Lettera 32, which is a 1960s typewriter, a bit of a design icon, so I got one of those. There are certain makes that I'm still chasing. Ginsberg is one of my favourite poets – I did my undergraduate dissertation on him. He wrote on an Underwood 5, which is a massive, gargantuan, cast-iron black thing. That's my holy grail. I would like to use all the typewriters in my collection, but some of them are very old and you can't get the ribbons for them anymore. It's a shame because some of them have really nice fonts. A lot of the time it's very hard to repair them, not least because it's difficult to get new parts. They're such complex pieces of machinery that if you lose one screw it might never work again. Having said that, a laptop has a lifespan of about five years, whereas a typewriter can last for 100, sort of like people do – and that's something that appeals to me. Writers tend to be quite obsessive people and my interest in typewriters has, I'm not ashamed to say, become quite obsessive. It's become part of my creative process and I'm stuck with it now. This is how I write. My flatmates are both graphic designers, so they have MacBooks and Corel drawing tablets and I'm fully aware, from living with them, of what a fantastic thing technology is and how it can enable you to do things that previously artists and creative people were not able to do. It opens all sorts of doors. But at the same time I think there is something to be said for film cameras, photographs and typewriter poems. You don't necessarily have to say: "That's outdated and we can do better now. "It's a nice thing that people can respect old technology and are still interested in fiddling around with it.There's a kind of resurgence of old technology, people realising that actually, it does still have something to give, and We don't have to leave it all behind. The two can exist happily alongside each other. A comparison of the prewar and postwar Everest portables shows that some thought was given to continuity in styling. The K2 is certainly more streamlined, but retains the shape of the opening in the ribbon cover, the "hips" that give Everests their distinctive look, and other details. Red rivals of the '30s in Italy. Which do you like better? Here's a somewhat later Everest that showed up on eBay a couple of years ago. Wow. PS: Sorry about misspelling "Pittsburgh" (the city; the typewriter is correctly spelled "Pittsburg"). According to The Typewriter Database, my Aristocrat was made in 1957. Click here to read about an airborne Aristocrat on Robert Messenger's blog. Here's a glimpse of the Yost before restoration. I finally realized the purpose of this little hook on the corner of the Blick: it can hold down a key lever, bringing the typewheel safely down for storage and allowing the typewriter to fit into an even smaller space. Ain't it clever? PS: I also got a brand-new Typescreen.